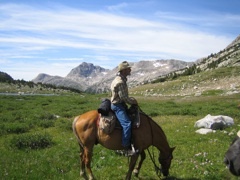 Those who would prefer not to walk or backpack (or who would like to get to a really remote location in one day), should consider riding horses into the Wind Rivers. We can arrange to go in as few as five miles or as far as twenty. All our gear is packed with us on horseback and we can carry some luxuries and fresh food. 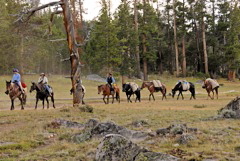 We establish a basecamp and the horses come back to meet us at the end of the trip. Guests do need to be able to walk to fly fishing areas as far as an hour and a half from camp. As in all our trips we will be camped right where there will be good fishing. Novice riders can be accommodated, but it is recommended that guests try to break in their riding parts by actually getting on a horse prior to the trip. Download our equipment list for horse pack trips in pdf.